Governor Doyle is urging Wisconsin residents to donate their time to help others. The governor is calling on people to take up a national call to service from President Obama, which Doyle says is an incredibly important thing to do. A summer-long campaign urging people to volunteer their time gets underway this week, ending with a national day of service on September 11th. The governor&apos;s office will be trying to connect volunteers with groups across the state. Doyle says anyone interested in finding out about local groups in need of help can look online or call 608-266-1212. 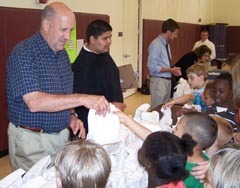 As part of his service, Doyle stopped at a Madison community center on Monday to hand out lunches to children. He&apos;s hoping others will follow his lead.